We’re all guilty of conflating “leads” and “prospects.” But at the end of the day, it’s not so much what you call them that matters, as it is the ability to verbally distinguish between opportunities based on where they are in your sales funnel. After all, you market very differently to someone prior to first contact than you would after they display clear interest in what you’re selling. So for our purposes, we’ll use an old fishing analogy to define exactly what we see as a “prospect” and where that falls in a funnel. A lead is any fish swimming in the pond where you’re casting. You’ve chosen this pond because you know that the type of fish you want likes those waters – just like you might buy a particular email list based on the knowledge that you’re looking for opportunities in certain locations and industries. So you’re not completely blind here. You already know that you have a decent chance of finding what you’re looking for. In fishing: What are you fishing for? In marketing: Who are you trying to sell to? In fishing: Are you fishing in the right spot and during the right season for that type of fish? In marketing: Are you marketing on the right channels for whomever it is you’re trying to convert? In fishing: Is the drag set correctly and are you using the right lure? In marketing: Are you delivering content in a format and style that will actually capture leads? You can pay for leads (a la email lists) and you can earn them through various lead-generation efforts (which we’ll get into in just a bit). So when does a lead become a prospect? And what exactly is prospect marketing? This is where a lot of people start to split hairs, and for good reason. The answer, in part, part boils down to the level of consideration, or the size of the sales funnel. A “light” consideration product has a much smaller funnel. You might buy a granola bar near the checkout counter without giving it a tremendous amount of thought because you’re just a little hungry. In this sense, you’re a prospect just by being in plain sight of the thing. If you’re a sales clerk, you basically just throw a net in the water and wait for some minnows. But that $1,000 laptop, or that $10,000-a year SaaS offering? The water here is a little murkier but more worth exploring. 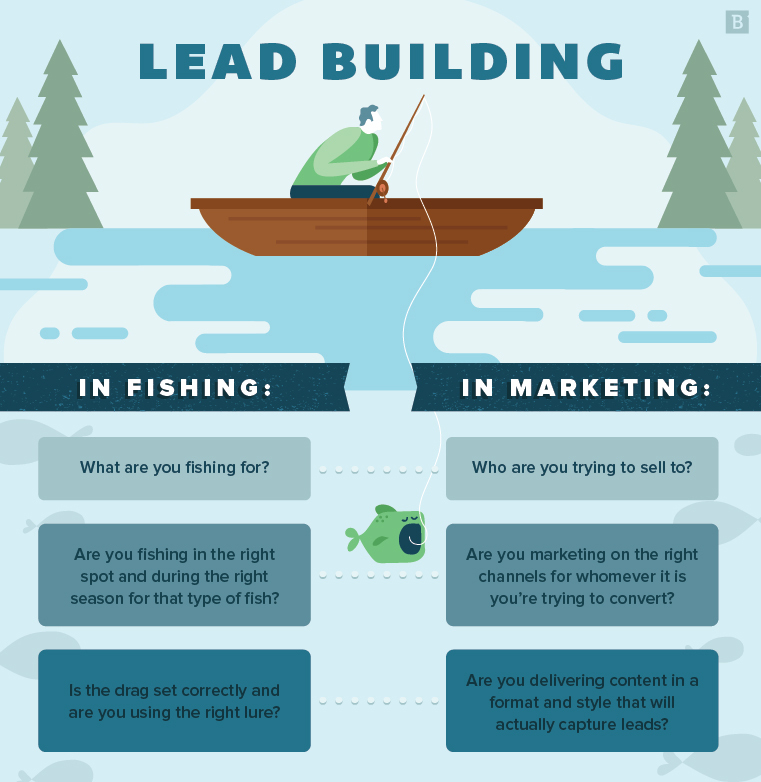 So then, focusing on products that involve greater consideration, we’ll call a “lead” someone who has shown interest in your content (a fish hanging around or lightly following your line), whereas a prospect is someone who has shown interest in your product or brand (a fish bumping or nibbling your lure). By definition, then, prospect marketing is how you bring a prospect deeper into the sales funnel. More simply, it’s deep-funnel content marketing. A lead is any fish swimming in the pond where you’re casting. Effective prospect marketing content is any content that increases the likelihood of a prospect converting into a sale. But before we say another word about that, we need to go over the golden rule of prospect marketing: Always facilitate sales and marketing alignment. Sales spends so much time speaking with and listening to prospects, so they can anticipate the questions and concerns that other prospects might have. Deeper-funnel content can then be created around addressing those recurring questions and concerns. This is an example of marketing automation. Rather than asking sales to repeatedly handle the same recurring queries, you create collateral that can do that without direct human involvement. This is also, more or less, how inbound sales works: You’re focusing on how your product meets a prospect’s needs rather than making assumptions about why they need your product. Inbound marketing works the same way (just replace every instance of “product” in the sentence above with “content”). By definition, prospect marketing is how you bring a prospect deeper into the sales funnel. OK then: What are some examples of prospect marketing? White papers: Well-researched and carefully crafted white papers are much more than just lead-creating machines. They can also be used deeper in the funnel to convey authority to prospects who are interested in your brand but aren’t necessarily sold on the value of your offerings. White papers can present your company’s thought leadership ideas, provide justification for those ideas through statistics, research and technical expertise, and finally, show where your products fit into the equation you’ve so eloquently articulated for the audience. In this way, deep-funnel white papers automate the “challenger” approach to sales, whereby you make a prospect re-evaluate his or her current approach. Case studies: Case studies act as social proof for your product. They illustrate concrete examples of how your products or services have solved specific problems that other prospects struggle with. Well-written case studies can certainly be used higher in the funnel, but in prospect marketing, their main function is to solidify the prospect’s interest in a particular service or product. Ideally, the prospect can almost see themselves in the scene you set, as if they could say “yeah, that’s exactly the issue that we’ve been having.” Case studies can be produced in textual format or as videos. Email marketing: Email marketing (which is largely replacing “direct mail”) is a form of direct marketing that can take place at nearly any stage of the marketing and sales funnels. It’s also one of the best ways to build and utilize a prospect database. You typically start with a list of leads (could be earned contact information from inbound marketing efforts, purchased email lists, people you met at conferences, and so on). You can send these leads content, promotions etc., ad hoc, as part of a campaign, or in a drip-campaign format. This is often referred to as “direct mail.” If certain recipients open your emails and take the prescribed actions (e.g., download an eBook of infographic), they can be moved into the prospect stage. At this point, you would ostensibly pull out the big guns – your white papers, case studies and video testimonials. The purpose here is to keep them engaged, escalate their interest and ultimately lead into the final mile of prospect marketing … the hard sell. It keeps a prospect engaged with your brand. If you create a piece of content that a prospect finds useful and engaging, they’ll likely come back for more, even if they’re still on the fence about buying. Good things happen when you’re still on a prospect’s mind. They might share content with someone else, and who knows? That could lead to a new potential prospect. The point is, not every stab at prospect marketing will expeditiously move the prospect into a sale (especially in heavy-consideration markets), so it’s important to have realistic expectations. Half of prospect marketing is just to keep them in the “prospect” phase (keep the fish on the line, so to speak). It moves prospects deeper into the sales funnel (inquiring about additional information and pricing). We call this a “sales-ready prospect,” and they’re generated through a culmination of the many efforts listed above. At this point, it’s really up to the judgement of sales how to proceed. Succeed here, and you’ll vastly improve the fluidity of your marketing and sales funnels. It’s worth reiterating that you need leads before you can get prospects, and in today’s multichannel world, that requires a multichannel effort. This is where the aforementioned inbound marketing comes into the equation. Top-of-funnel content such as blog posts, infographics and how-to videos that live on your web properties help generate traffic on your website and your social media channels. We’ll call these visitors “opportunities.” Each opportunity is a potential lead. You can move an opportunity into “lead” status by incorporating mechanisms into your top-of-funnel content that will drive deep-funnel engagement. For instance, you can offer access to eBooks, case studies, infographics and other marketing collateral in exchange for contact information. This can be achieved with scroll-triggered contact forms or embedding clickable buttons that redirect to gated-content download pages. The bottom line is that you need to nourish your lead list. And in this sense, inbound marketing is a crucial component of prospect marketing. Otherwise, remember to reset the drag on your reel after a big catch, always carry your fishing license and beware of waterfowl when casting.